Shamik Photography ~ Devoted to the Natural Elements: My name is "Squirt"
Meet "Squirt".... 3 days old here !! We have here on our little farm our own breeding pekin ducks and we cannot forget "Lucky" our 2 year old call duck. We hatched successfully 13 babies !!!! Twelve were born starting at 5 a.m. on July 26th and Squirt was born on July 27th at 5:30 a.m., so it was a busy couple of days and a busy month!! Here they all are in the brooder 3 days old!! Squirt is in the far bottom right hand corner and the tiniest of the brood!! Looks like a comfy spot to rest my head.... !! We decided to keep Squirt and add her to our existing duck family and we have found two loving homes for the other 12....(six to each farm) A couple of little stuffed teddies in Squirt's house took away some of the lonesomeness.... We go outside for lots of exercise and playtime and the other ducks and chickens are curious about the ''new family member'', but we have to wait a little bit longer until she is feathered and big enough to tag along with our other waddling angels in the pond. It will be fun to watch her playing, exploring, chasing after bugs and being mischievous like the others. It is also going to be interesting to see if Squirt has Lucky's looks or mama pekin's when she is fully grown.... We will keep you posted!! 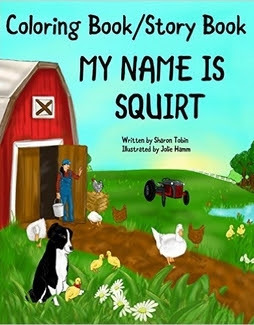 Squirt narrates her story of a warm summer day. She explores her enchanted world while enjoying her friends and meeting new ones. She always has time for fun, especially with Skye, who is her best friend. Have you ever seen a baby duck riding piggyback on a Border Collie, hiding in a sneaker, or sleeping with her teddy bear? Now you can! This picture book is a great addition to any child's collection, and will provide your family with many cherished memories for years to come. Come join us in the magical world of Squirt, Skye, and their delightful friends. Now Available on AMAZON - Paperback and eBook!! Or if you prefer AMAZON.COM in one easy step!